Marketing in the Middle East is becoming the topic that everyone I know is talking about. It is not anymore a concern of only the companies. Everyone currently is having some sort of idea or services or even talent that they need to market. It is getting big and crazy a becoming a demand for everyone. I get it, it is one of the millennial generation’s lifestyle and thanks to the social media and its tools for small businesses. Eventually, the world is currently living in the era of startups where everyone is having a talent or an idea and want to make a profit out of it. I understand this, but why everyone thinks that marketing is the last thing to consider? That’s what I don’t understand. The Middle East region is rapidly evolving, especially in the last 2-3 years, and getting highly influenced by the global trends such as e-commerce, business entrepreneurship, media and fashion influencers, and brands lifestyle products. We might be able to confirm that the region is emerging fast and everyone including individuals is looking for jumping on board, yet marketing will be always a challenge that is everyone is struggling with. Apparently, you cannot have a straight answer on what is the top tips on marketing in the Middle East. That’s why I would like to invite you for a nice ride (I hope) to explore this market and to understand the nature of the consumer around here. First, do you like western movies? This is some kind of metaphors I use but you can still ignore and you will miss nothing. The Middle East is rising as one of the fastest-growing markets and it is becoming more attractive due to some major factors. Demographic structure of the region is playing a big role with approximately half of the population in Middle Eastern countries are currently under the age of twenty-five. The young segment is spending more time on social media than other the global average which is providing great opportunities for marketers to use social media and content marketing especially for businesses such as consumer products, food & beverage, and entertainment. In the Gulf area, many of these younger consumers are affluent professionals, and this presents a big market for luxury brands and electronics. While some countries in the region are facing economic instability, the market is still having low taxation compared to the European markets. The region has the highest spending on cosmetics per capita in the world and the appetite for beauty and fashion products is getting bigger. The Arab consumers are relatively easy to segment and identify the customer persona. However, If you are going to use traditional surveys, then it is a bad idea. The Arabs, in general, are unlike other nations and they are more conservative about sharing their honest feedback. Monitoring trends and tracking the social media engagement are more effective tactics to define the key motivations for your potential customers. Furthermore, proper data-driven approaches can definitely get you the insights you need. Finally, localize not only your marketing content and campaigns but localize the strategy and the brand to be able to reach your target segment. If you don’t have locals who are crafting your marketing message, then you need to hire someone who is expert with the local culture, slangs, and trends. Some of the well-established brands are using the same marketing tactics in the region for decades and guess what? It is still working. When I was in the advertising business someone told me an interesting story: “Back in the early 90s we had a meeting with P&G and they rejected many new creative ideas for a new campaign. The reason is that they believe that the Egyptian markets only engage with the Ads that it has a song and entertainment. Simply they didn’t want the campaign to be focused on the product features and wanted it more entertaining”. They eventually did have a good understanding of the market and made the choice to stick to what it works. Now, which is 20 years later, you would still see that they didn’t change their tactic. They only adjusted it to fit with the digital media platforms but the tactic is still the same. Common advertising and campaign tactics are still effective for the mass consumer in the Middle East. The consumers in the region are highly influenced by the media and mass campaign over the personalized experiences. A viral campaign is widely effective in shaping the consumer habits and it works for big brands, media production, and even politicians. There is one important factor you need to fully understand about the Arab consumer and never forget. Arabs are highly influenced by the social concerns. They tend usually to buy the things that recommend by their circle of friends and family with putting fewer efforts on exploring the specific features of a product. Not only that, they also tend to buy products to gain a higher social class appearance. The majority of consumers in the Middle East are trapped in trendy and fashionable brands and desperate to be part of one social group or another. They are suffering from an inability to choose based on their individual needs as this might lead to a prejudgment by the society and their circle of friends. Maintaining a certain social image is a quiet big concern which highly affects the consumer habits in the region. If you are wondering about where the big brands are exceeding in creating a fashionable brand image? You will need to spin the world map and land in the Middle East. You might not find every girl wearing Nike shoes like in Singapore but you will find that moving up in your social class requires an iPhone. Arabs don’t just believe it is fashionable, they believe it a star added to their exclusivity. If you are not selling a product with high quality but it is not a fashionable trendy product, then you are going to struggle. Marketing tactics: How to build a marketing campaign in such market? My advice for you is to try to build up a group of loyal customers and create a very personalized email campaign. Make them feel exclusive and build a give them the attention they demand. Focus on how you position your brand in the market and use fabulous marketing materials such as high-quality videos. Grow your segment gradually using an effective social media engagement and never forget to maintain an excellent customer support. Some mature markets still have the consumer that reads and check the specifications and compare before they make a decision and purchase. The region is considered as one of the emerging markets with an absence of critical thinking and product comparison practices. A quick tour in the most popular e-commerce websites would help you to understand that the number of product reviews is relevantly lower than most of the global markets. If you are selling for the Germans, you should be ready with very dense product description and very caution with the customers’ feedback but in the Middle East, this is not the case. Marketing tactics: Branding and marketing message are the most sensitive marketing materials you need to consider when you are releasing a product for Arabs. Build a campaign that will make your brand stand out in the market and always deliver your USPs in the in an easy way. The landing pages should carry out a very clear message up front and avoid any irrelevant lengthy descriptions. The consumerism is drastically changing the lifestyle of the local consumer in Arab countries. Consuming more might sound like a great opportunity for businesses to market, but that’s not true and you have to think again. Consuming more of the cosmetic doesn’t mean a great opportunity for you to open your state-of-art cosmetic. The well-established brands will absorb this growth by producing a variety of products and acquiring small companies. Over the years we were able to witness how the local investors were filling the malls, the store shelves and road billboards with western brands instead leaving a smaller and even tighter window for the consumer to browse the alternative products. The biggest local firms are investing and expanding with brands like Carrefour and IKEA. Amazon acquired Souq.com and dominating the e-commerce in the region. 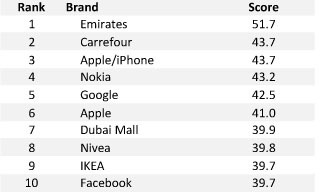 That’s the ugly fact about the Middle East market; the consumers are surrounded by big brands which are massively funded by local investors. The consumer will end up consuming more of the same item or same brand instead of being open to alternatives and new experiences. Don’t be deceived by the initial figures about the market size for your services or industry. Don’t launch your business model and marketing strategy based on these. If you don’t dig deeper into the market insights and adapt your strategy considering the price-sensitive consumer, you could lose a vast amount of time and resources. Consumerism is also changing the lifestyle of the consumer and instead of satisfying people’s needs it is constructing commercial needs and desires to keep the production growth. In a country like Lebanon, you would see that some consumer tend to buy a piece of branded clothes instead of buying normal varieties of outfits. In Egypt, some would buy an iPhone even if it is beyond their ability. Marketing tactics: If you want to conduct an effective strategy for marketing in the Middle East, you shouldn’t only focus on the factors you developed your product based on. It is more like a “Blue Ocean strategy” where you need to focus on how you brand your product. It is important to know that Arabs interact with the promotion campaign more than they do interact with the product itself. They will have higher awareness about the piece of the advertising than the product name. Make sure you campaigns are very effective and carry out a strong message. Brands are turning into symbols of lifestyle and exclusivity in the region which is bringing huge struggles for startups and SMBs. Back in the 80s, the market had the first wave of international brands which boomed in the recent years. The brands’ big investments and the massive advertising made the local brands lose a huge chunk of the market share. Some of the local brands started to change their strategy and try to become more specialized and localized but the truth that many of them are exiting the market. We have seen many creative and out-the-box solutions joining the market but after a while, they discover that the local consumer is more attracted by the international brand. Here the marketing investment plays a big role in the game and marketing know-how of the brands will give them always an edge. Recently, I’ve wondered why all girls in Arab countries are wearing a “Datejust” Rolex? I found out that most of them are wearing a fake copy. They still would prefer to wear a fake copy of a big brand than going for another Swiss brand like Swatch. I wouldn’t call this as a final resolution but I can see that local brands are struggling to grow in industries such as beauty, fashion, and retail. Marketing tactics: Don’t compete with the brand and build a strategy that can help you identify the gaps. Use gorilla digital strategies and maximize the use of data insights. Establish organic acquisition channels with your SEO and Social Media to decrease your advertising needs. Build an extensive content strategy and gain the client confidence by being a source of information. Influencer marketing is the key to success in the region. To get people to trust your product or services you need to influence them with a celebrity or opinion leader or media advocate. This works much better than building a creative concept for your marketing campaign. When Vodafone wanted to beat the competitors in the Egyptian market, they hired Mo Salah and that’s it. We always wonder why startups are able to market and grow fast in some environments like the USA. The nature of the market and the consumer behavior is the key. Arabs don’t tend to try new solutions or services to fulfill their needs. Once you launch a new app or product, then you will generate a niche segment which is not enough to sustain your growth plans. This is what is happening with the majority of startups in the region. I believe that the consumer habits in emerging markets require much more than a creative idea. The business model should have room for adoption and product changes to be able to survive. The key here is not the consumer needs but the business model flexibility and ability to evolve. Marketing tactics: Don’t rely only on the product and find ways to communicate the benefits. Reshape your marketing message to provide are a compelling message. Open your platform or product for test drives and influencers. Be realistic and market what you can deliver. Don’t focus on going viral and focus on building more effective campaigns. Use data analytics effectively and get your CRM connected with online analytics to have a better understanding of the buyer’s persona. In conclusion: Marketing in the Middle East has its gaps which you can benefit from. To launch an effective marketing strategy you need first to have a solid base of information about the market and what is the possibilities. Understanding the consumer doesn’t come right away from published statistics or conducting surveys, it requires running intensive researches in order to get the proper business analysis. Finally, while social media is one of the best channels to generate leads if you are marketing in the Middle East, but yet I still believe that content is the king and the best method to generate leads on the long-term and at a lower cost per acquisition.